Under what circumstances is a boat obliged to install a Tier 3 generator set? 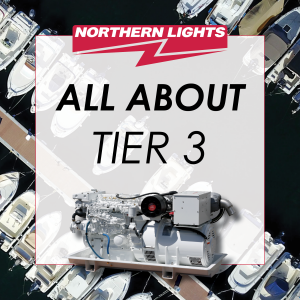 Tier 3 is required on any yacht that will or does carry a US flag, any yacht that is built outside the US and imported in to the US for sale in the US. Is Tier 3 required for a boat that is imported by a dealer into the US – but flagged elsewhere when sold? An engine that is EPA certified can leave and re-enter the US. An engine without an EPA certification can not be used in the US and if it is exported can not be brought back into the US. A boat imported to the US for sale to the US market would need to be built to US standards. If then sold off shore by the broker or the owner it would still have the US EPA certified engine. If the new owner then wanted to change the generator to be 50 Hz (turning down the engine speed to 1500 rpm) that would then void the EPA certificate. Is Tier 3 required for a boat built now – flagged outside the US but then resold (at a future point) and then flagged in the US? Lots of boats are built outside the US and imported to be sold and used in the US. The boat engines must be EPA certified. When does/did this requirement come into force? EPA Marine Tier 3 is the current US emission standard, it is being implemented in stages with the first stage starting in 2009 on engines (0.9/cyl, kW<19) and the last stage starting Jan 1, 2018. Each stage has been based on engine displacement and maximum horse power. Is the requirement in any way linked to boat size? Not to boat size, but to engine power. EPA Tier 3 applies to all marine engines up to 600 mkW. For engines above 600 mkW Tier 4 applies. Is the requirement in any way linked to engine power (i.e. is there an exemption on smaller generators)? EPA Marine rules apply as noted above. What causes confusion is there is an EPA Tier 3 and Marpol Annex Tier 3. While the EPA rules (Tier 3, Tier 4) apply only to US certified engines, the Marpol Tier 3 applies only to engines 130 mkW (174.3 hp) and above. Is the date of the ‘stage’ determined by supply of the engine, the laying of the keel or the delivery of the boat? Yes to all to some degree. As EPA Tier 3 turns on in stages, it only effects the emission Tier level of the engine based on the manufacturer’s build date. For example, an engine built December 30th could be a Tier 2 and one built on January 1 could be a Tier 3 if there was a rule change effective January 1. Northern Lights does not have any models that will be effected by the Jan 1, 2018 change. All of our EPA approved models are Tier 3 now, with no further changes planned by the EPA.